This test was done on the evening of December 31st, 2016. The same evening I did the test for Part 2 of this series. The following pictures show the windows with no insulation on the windows. The temperature of the windows is approximately 47 degrees Fahrenheit. 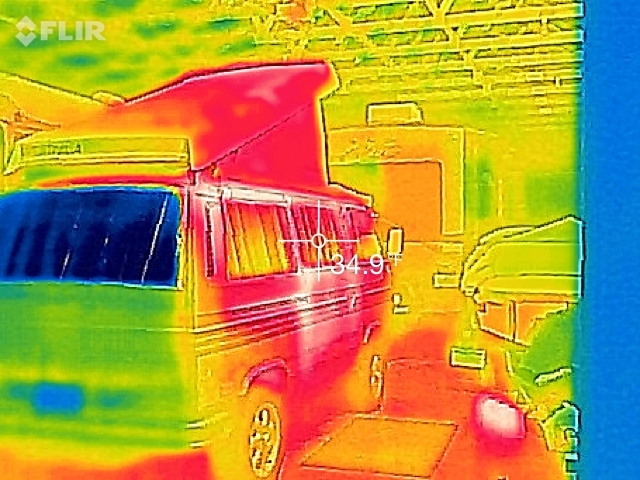 Considering that the inside of the van is 70 degrees, the windows aren’t doing too bad of a job of insulating by themselves. I thought it would be worse. These next pictures show the windows with the insulation in place. You’ll see that the temperature readings are right in line with the ambient temperature of the barn. That’s a 12-15 degree drop, which is great news! 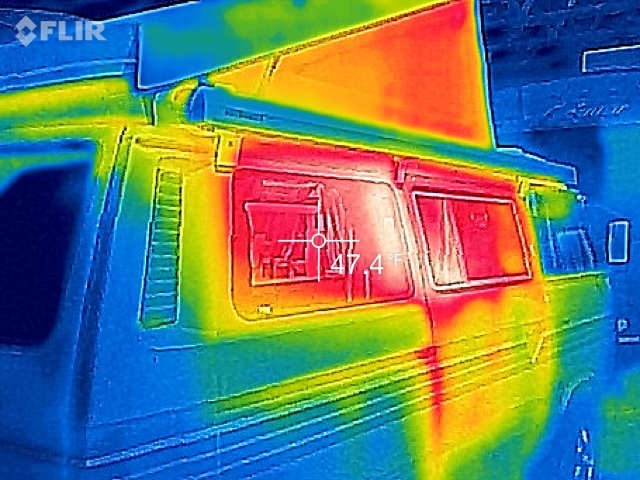 Here’s one last picture showing the temperature of the sliding door below the window, where there is no insulation (that I know of). Works great!! Really helps keep the heat in for me. 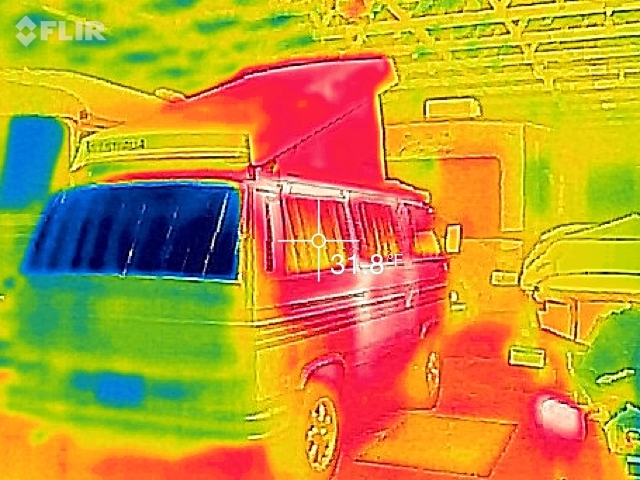 Gets really dark inside the van, if you want to sleep during the day. Better than blackout curtains. Easy to install. Held on by magnets. Way easier than the interior thermals that are held in by suction cups (I have a set of these too). Really gets dark inside (I realize this was a pro too). It can be a little discombobulating when waking up in the morning. it seems like night time still, even if it’s bright outside. 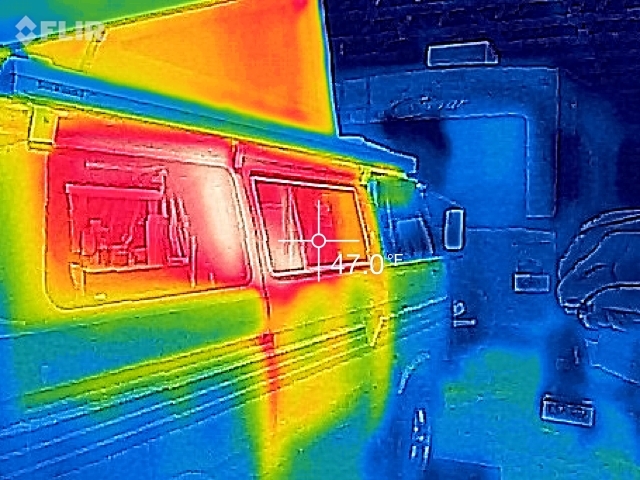 If you want to peak outside through a window from inside the van, you can’t. Potentially a problem when camping in high wind? I have not tested this. 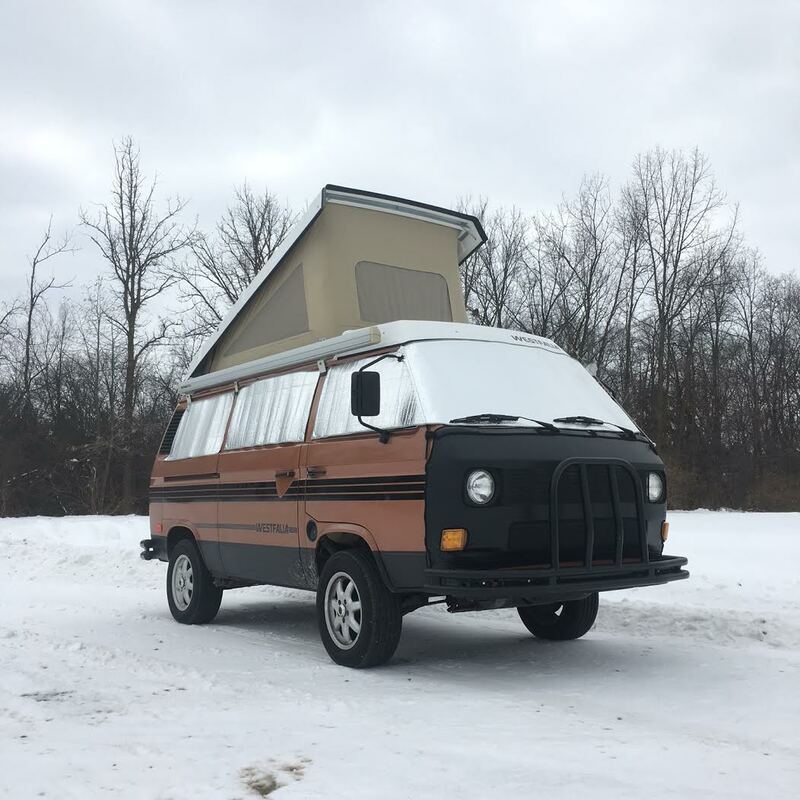 This entry was posted in VW Vanagon Westfalia on January 10, 2017 by Wolfy. Hi Thomas. Keep me posted on how it turns out. I’m excited to hear about your results. I cut out a set of these to reduce summer heat build up. 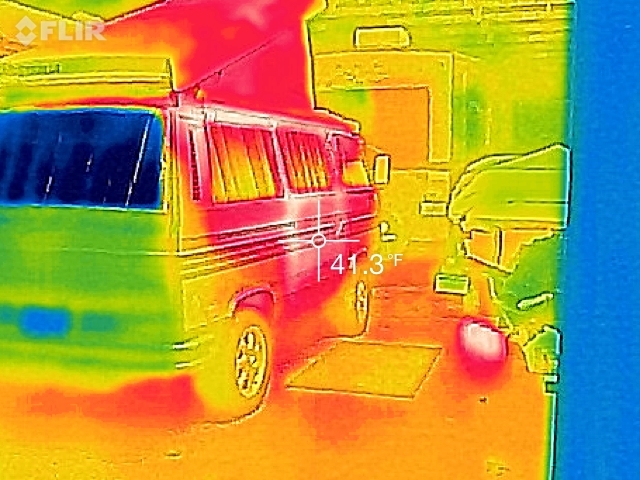 Although I do not have your kind of thermal image data, they keep our internal temps quite a bit cooler. Hi Cliff. Excellent! 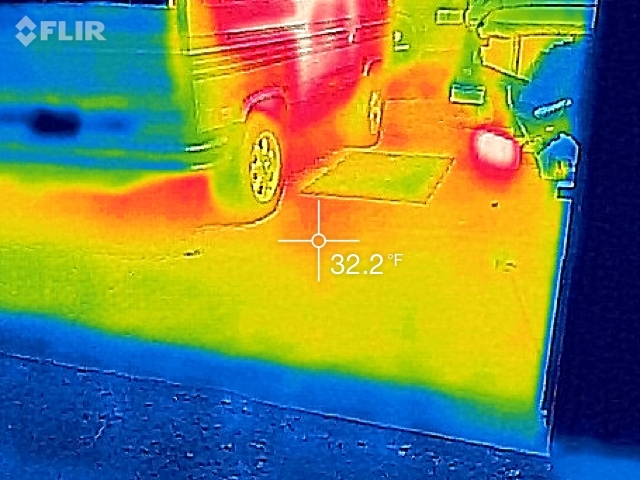 The practical hands-on experience can be more important than the thermal imaging that’s for sure. 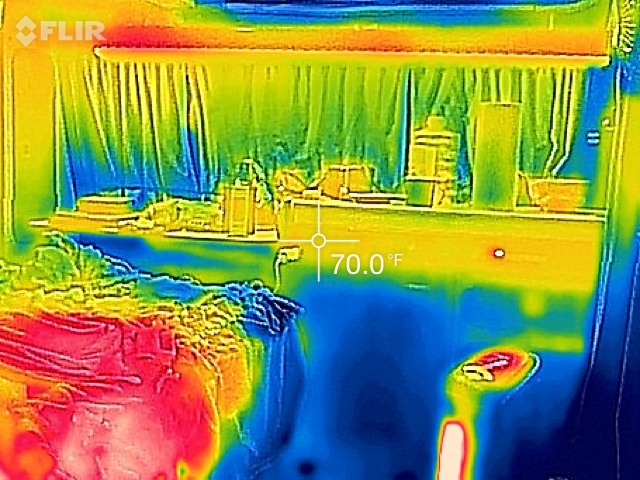 The thermal images really help support my thoughts on how well it works. Thanks!